Deceuninck-Quick-Step's Julian Alaphilippe has taken the victory of the sixth stage of Tirreno-Adriatico. Davide Cimolai and Elia Viviani were second and third in the final sprint. The sixth stage of the Italian race took place between Matelica and Jesi over a 190-kilometre course that was bound to finish in a bunch sprint. The escape group of the day was formed in the first 10 kilometres and included Davide Ballerini (Astana), Mirco Maestri (Bardiani-CSF), Gijs Van Hoecke (CCC Team), Jose Joaquin Rojas (Movistar), Dayer Quintana (Neri Sottoli-Selle Italia), Igor Boev (Gazprom-RusVelo) and Ben King (Dimension Data). The front group built an advantage of three minutes over the peloton and with 12 kilometres to go, only Rojas and Ballerini remained while the others were reeled back in by the bunch. With four kilometres to go, the pack got closer to the front men but the Italian of Astana didn't want to give up and accelerated, leaving Rojas behind. At three kilometres from the end, the remaining escapee was finally caught and teams like Bora-hansgrohe, Deceuninck-Quick-Step and UAE Team Emirates took control of the speed of the peloton. The sprint train of the Belgian race took control of the last kilometre of the race and Peter Sagan seemed to have a good position inside of it as well. The first rider to launch an attack was CCC Team's Greg Van Avermaet and he was followed by Max Richeze (Deceuninck-Quick-Step), who took Julian Alaphilippe with him while the main man for the sprints, Elia Viviani, was left metres behind. 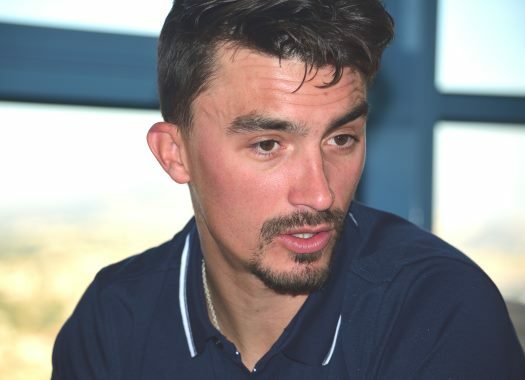 Alaphilippe showed to have the better legs of the bunch and crossed the finish line ahead of Israel Cycling Academy's Davide Cimolai and Viviani. AG2R La Mondiale's Clement Venturini and Sagan completed the top five of the day. Adam Yates (Mitchelton-Scott) kept the lead of the General Classification ahead of the last stage of the race, a 10-kilometre long time trial in San Benedetto del Tronto.